Renée Zellweger, a woman of many talents, has strapped on a wig, shimmied into a gown, and done something fun to her eyebrows; and now here she is, as Judy Garland. The “first look” at Zellweger, in what I imagine critics will call “a ROLE of a LIFETIME! !” shows a pretty faithful reproduction of Judy Garland in her last few months. The movie will cover Garland’s sold-out string of performances at London’s Talk of the Town, and the difficulties she had with management, fans, the venue, and one assumes, herself. There will be singing, but probably not much dancing—some waving of the arms while sitting on a stool, perhaps. There will be pathos. Someone will cry—me, or you, or the person sitting next to you in the theatre when you watch it. 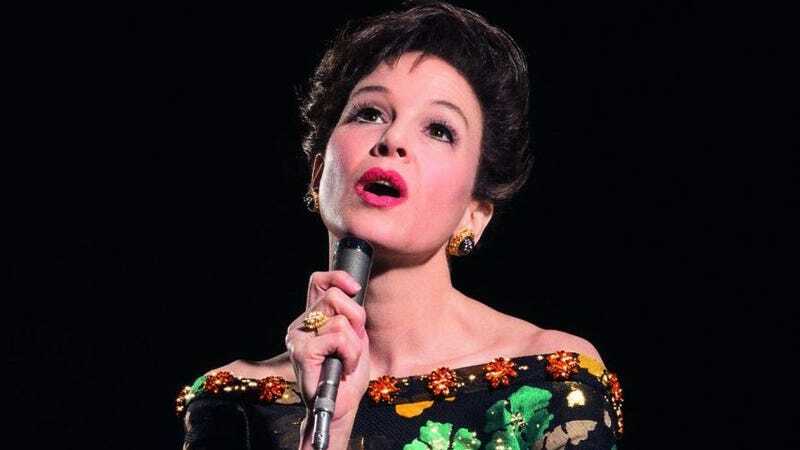 When the news of this casting was announced, I rudely surmised that Renee Zellweger would not be able to live up to the shabby, camp legacy of a late 1960s-Judy Garland. I was...wrong!! At least for now. Here’s Judy and her fifth husband, Mickey Deans, in March 1969, cutting a wedding cake while wearing a marabou-trimmed dressing gown. The hair! The brows. The bared-teeth grin of a woman looking for love in all the wrong places. It works.